So… the season is over. The hype is over. The best season in the history of all seasons thus far ever is over. It’s all so over. BUT, my friends, don’t you worry your pretty little Oregon Duck selves… I started a little countdown and there is ONLY 229 days until the 2015 season starts!! Isn’t that great?! Countdown until the first game of the 2015 season. Countdown until the first game of the 2015 season. (Screenshot taken at 10:40 a.m. pacific time). I mean I know that sounds like a lot but it’s gonna be okay for so many reasons. For one, football isn’t the only sports organization the University of Oregon has! Oh no, no, no. We have basketball, we’ve got volleyball, track and field, swimming, golf, tennis, acrobatics and tumbling, softball and baseball, and lacrosse! Let’s remember that as a true Oregon Ducks fan we are fans of everything that has to do with the school not just the football team. 229 days is actually 5,496 hours, there are 24 hours in a day so in one week you can knock 168 hours off! Not to mention that you should be sleeping on average 8-10 of those hours so really you only have to be awake for 14-16 of those hours. AND if you’re a full-time student you probably have about 14-18 credits at school and they always say calculate two hours of homework for every credit hour you’re taking so there’s a big chunk of your homework time that you need to be focusing on your school work rather than football! OR if you work full-time, 32+ hours a week are being spent on your employment so there’s a lot of hours to stop worrying about. If you’re a full-time student and have a full-time job then… well, this is a good little break for you to catch-up on your work without the football distraction (I can’t help you with all the other distractions, I’m still trying to figure that one out for myself). If all those numbers are too big for you still then let’s look at it as, in 229 days there is seven months and 17 days. Smaller numbers sound better… and in seven months and 17 days there are only 32 weekends. That’s all, just 32! 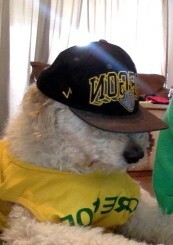 My dog in Ducks gear. It’s just 229 days guys… we can do it… right?